File under ‘plugging’. I’m a huge fan of the urbane Alex Bellinger, smallbizpod and the superb smallbizpod podcasts. So it was a pleasure to scribble some thoughts for the smallbizpod blog about things people should know about eBay. In other news. The smallbizpod piece and my own post regarding empwronline was picked up by buildaskill. Buildaskill bills itself a site dedicated to small and home-based businesses but why they would use an image featuring a Nazi rally in an article about eBay Australia is anyone’s guess. The analysis of PayPal is of interest though. 2009 is going to be a critical for eBay’s payments division. In Q3 2008, PayPal processed a greater volume of payments off eBay than on. Are we looking at a PayPal de-merger or acquisition? We shall see. The wartime images used in that piece relate to the “propagandist” elements of the announcement discussed, and to the titbit about eBay Oz’s intended 10,000 (a legion) to form a consultative committee of users. In particular, whether those will be “card carrying eBay party members” or a random selection – eBay hasn’t built up a good record of listening to dissenters this year, in fact they’ve demonstrated wilful punishment of them in many ways – the parallel was too good to leave uncommented. The images were intended as cynical sarcasm (or sarcastic cynicism) regarding how the project might be implemented. I’m also guessing you missed the Dreamworks Studios style special effects that had been worked on some of them? Not really surprised if you did – one of them was especially subtle … too subtle even for some of our most observant regulars who already know to look for such things. Hohum, guess we’ll have to be more obvious in future? By the way, I did enjoy your piece on SmallBizPod. 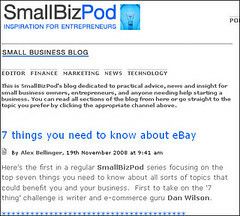 I’m thinking all us bloggers need to push out a lot more such practical prose this winter, as I feel there will be a mass seller exodus after the “January Sales CLDs”, and without some positive advice, eBay will be left to the mega-sellers next year, which will certainly speed a demise as a small seller venue, and as a community platform. I’m doubtful we’ll see eBay selling off of PayPal, unless the recent G20 Summit conclusions really put teeth into the plan to regularise all major payment processors and it forces PayPal into bank or similar registration and regulation. What we may see though, is a parent-child reversal, where eBay becomes a subsidiary to PayPal. Now wouldn’t that be interesting, especially if Rajiv could be tempted back to take the reins? It is possible the two may split, and a new higher level group holding company formed … maybe with Meg coming back to take the reins of that? Such a move would allow for further splitting down of the group (Skype & classifieds etc) to avoid the Microsoft-style anti-trust suits and forced splitting that occurred a few years back. It would also give more scope for the new holding company to diversify into other sectors more easily, without “polluting” the eBay or PayPal brands. Interesting times in the next few years – that’s for sure. Yup, I saw that the images had been tinkered. Leninist imagery and reference to ‘democratic centralism’ would have been more aposite. (And btw let’s not confuse images of Nazis with ‘wartime images’). PayPal is a bank in Europe. I’ll confess to them being “wartime” images as being incorrect – they were all from the 1934 Party Rally at Neurnburg (one was from 1936), which was before any of the atrocities began, and when “the party” was actually doing good for their country – economy, industrial, and infrastructure rebuilding and the like. A lot of people forget about that side of the early regime. Shame they went so wrong a few years later. PayPal may be a bank in Europe, but PayPal UK (and US) is outside of the Financial Services regulatory organisations on the western side of the North Sea – feedback I’m getting is that, that is starting to get up a lot of people’s noses … on both sides of the Atlantic. Additionally, there is a mounting criticism that eBay UK and PayPal UK should be registered as UK entities and brought under the supervision of UK regulators, rather than hiding behind the lederhosen of their s.a.r.l. regional parents. A lot of people are of the opinion the reason they do that is to avoid complying with UK protections for customers – e.g. the 21-day funds holds and the one-sided contracts accepted by inaction. I’ve also heard accusations that the move from using a Swiss operations HQ was merely to avoid the connotations involved with squirreling funds away in Alpine banks with numbered accounts …. which brings us full circle back to those photos and what the photographed persons were doing 10 years after those snapshots were taken … hmmm? Dammit Dan – there was me planning to have a positive-thoughts day today – look where you’ve led me off to now. Frankly, too, comparing PayPal to the Nazis is at best crass and also just plain offensive. It is the sign of an argument that relies more on insinuation than fact. If you want to criticise PayPal here, please do. But you can leave the Nazi imagery and allusion at the door. Thanks. Please allow me to say though (and delete/edit this if it offends you) that when all is said and done, following the national economic decimation after the Treaty of Versailles, the Nationalist Socialist Party did a remarkable job of rebuilding Germany’s economy through the late 1920’s and early 1930’s. The massive infrastructure projects and the state-sponsored creation of (today’s) industrial giants (e.g. A.G. Farber, Volkswagen, et al) was never going to happen under the Kaiser. The economic stimulus and enablement strategy used, has become the blueprint for many countries during times of recession. Even what I have seen of President-elect Obama’s plans for January onwards, in the US, is using much of the same pathways to national recovery that were used in the first decade of Hitler’s Chancellorship. Regardless of how appalling his later policies were, Hitler has to be given recognition for those earlier rebuilding governances. Next time anyone enjoys barrelling flat-out down an autobahn, they should remember who it was who built them in the first place, as well as what history revealed their ultimate unacceptable role was for. Without wishing to be confrontational, or condoning in any way, post-1936 (Olympian) Nazi racial policies, those were physically little different to the digital-commerce protectionist agenda pursued this year by eBay UK. If you have any doubt about this, read the posts on the BuildaSkill blog (in the eBay UK category) particularly from August 25 to September 27 this year. Ignore the emotions and hyperbole and concentrate on the progression of facts. Systematically, the Richmond team shut out overseas sellers from the site. National pride viewpoints of UK-based commentators cannot wash away what external sellers have seen and experienced from eBay UK, and no amount of “PC” commentary regarding the comparisons with 1930’s Germanic purifying can delete the parallels. Those parallels are simply too strong from external viewpoints, and more than once I have stated this makes me ashamed to be British. eBay UK systematically made the rules location-disadvantaged for non-UK residents to sell at the same profitability, on the UK site, as British residents. They continue to do so with their implementation of new-BIN/SIF fee structuring, and eBay Global continue attempting to do so with their lack of differentiation between same-country and international shipping-DSRs. This WILL lead to a resurgence of location-abuse, both seller-location, and item-location. I have already witnessed that several high-volume SE Asian PowerSellers have changed their registered addresses from their expatriate residences to their home country addresses, without physically relocating, and this is accelerating. Both you and I know that solely-international sellers can never hope to achieve the same level and consistency of shipping-DSR scores that solely-national sellers do achieve. eBay refuse to factor this into their new “(un)level playing field”. That is one major reason why so many sellers are moving their international sales to other channels … and ultimately it is what will kill what used to be known as “the global marketplace”. Ed: none of your comments have been edited, tweaked or amended for any reason. Ed: you haven’t disclosed where you are located. It would be useful info. Hi Dan your last question is one of unprecedented interest throughout the bloggosphere, from which I have convinced myself (rightly or wrongly – lol) that it acts as a traffic generator on BuildaSkill with people hoping I will let it slip … for that reason, I never disclose more than “on an island in the Indian Ocean” as that much is identifiable from my IP address when I post on people’s blogs. There are clues in some of the blog posts, but you’ll need good knowledge of the local geography to work it out. Nothing like a little intrigue to pull the curious out of the woodwork, and if it helps with site traffic, what’s the harm? Hmm. Not here. Not in this little corner of the blogosphere. I didn’t ask a question. I made a statement.